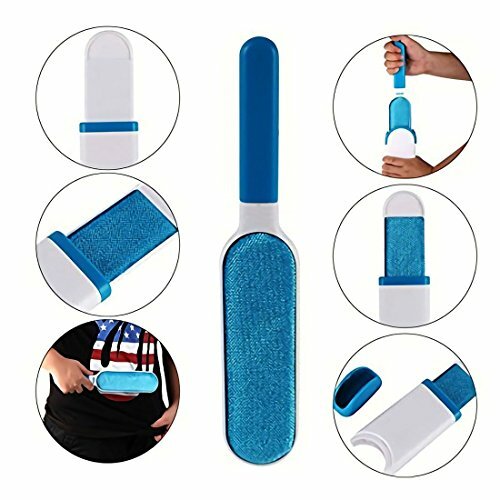 This pet hair remover set is easy to remove pet fur, fabric, lint on the sofa, clothing, car seat, carpet. Convenient to use and with self-cleaning base to keep brush tidy. You will get a travel-sized remover as well. This hair remover set will definitely bring much convenience to your life. Easy to remove pet fur, clothes fabric, lint on the sofa, clothing, car seat, carpet, etc., keeping your home tidy and clean. Swipe the surface you need to clean by the double-sided brush, quick, time saving and effortless. Dip the brush into self-cleaning base and then the fur will be removed from brush. Convenient to use, no tapes or refills needed. Comes with a travel-sized hair remover, light weight and mini size, great for travel use. FFORTLESSLY REMOVES FUR & LINT - Keeping your clothes and furniture fur-free and lint-free has never been easier. The soft and easy grip handle makes removing pet hair and lint a comfortable and effortless experience. No refills, no waste, no power plug! It's the most convenient and mess-free way to remove your pet's hair. REUSABLE & DOUBLE-SIDED - The double-sided brush can be used again and again, making it extremely economical and environmentally friendly. If you have any questions about this product by COZY HOMY, contact us by completing and submitting the form below. If you are looking for a specif part number, please include it with your message.